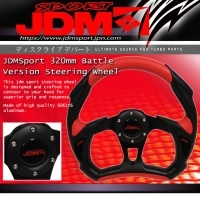 Battle version racing Steering wheel 320MM. Steering wheel is precision crafted using the finest materials with the most cutting edge design. This performance wheel features a 3 spoke design. Made of 6061T6 aluminum. Light weight and durable. Application: Any 6 bolt pattern hub. Installation Difficulty: Basic Mechanic Skill.